Four of America's hottest food bloggers go head-to-head in a culinary battle worth up to $20,000! First, the bloggers have to make something "between two buns" using a list of top-searched ingredients on the web. Next, they must make their best taco platter without any of the traditional taco ingredients. Finally, the last two bloggers must turn out a "trending dinner" featuring hot and not-so-hot ingredients chosen by Guy Fieri's dreaded Food Wheel. Four grill masters hit Flavortown for some red-hot grillin' games! First, they must think small and fit all the ingredients for their hometown grilled special into ultra-tiny grocery bags. Next, they play a game of Grocery Golf to find out which wild ingredients they must feature in their best grilled sandwich. Then, the two final chefs are interrupted while shopping for a steak dinner when Guy Fieri announces "closing time!" Can they stand the heat and win up to $20,000, or will their hopes go up in flames? When four culinary juniors come to Flavortown, someone could get schooled. First up, the kids use items from Flavortown's sample tables to make a 'School Lunch Remix.' Next, our young chefs weigh there options of ingredients in the their 'International Dishes'. In the end, only one junior will earn a chance to shop Flavortown for up to $20,000! Eight of America's best celebrity chefs compete against each other in a no-holds-barred $40,000 tournament; taking on the express lane; four ingredients or less to make the best Italian dish. It's part two of the Superstars tournament, and the theme is budget battle royale! The seven remaining celebrity chefs are each given $36.01 to buy their groceries, but should they spend it all on the initial "taco combo" challenge or keep money in reserve in case they must cook again in the Redemption Round? The three bottom chefs are forced to duke it out for survival by making a decadent dessert with whatever money they have left. In the end, one chef goes home and six move one step closer to winning $40,000 for charity. In the third leg of the Guy's Grocery Games: Superstars, the remaining six chefs are all given the same grocery list, but must compete in three one-on-one battles to see who makes the best breakfast, lunch or dinner. The winners of these match-ups are safe, but the three that get edged out head into the Redemption Round, where they must flip the ingredients of tiramisu into an elegant entree. Which two chefs will rejoin their peers for the semifinals and get another shot at becoming champions for charity? It's the semifinals of the Guy's Grocery Games: Superstars and Guy Fieri has devised two shocking shopping cart games for the five remaining celebrity chefs. First, they must search the store to discover where Guy has hidden their personal carts, only to find that they must make their best burger and fries with a bizarre ingredient that he left in each one. The winner gets an automatic pass to the finale, while the bottom four must fight for redemption by making their cheesiest dish -- after Guy's surprise twist of a four-way cart swap! 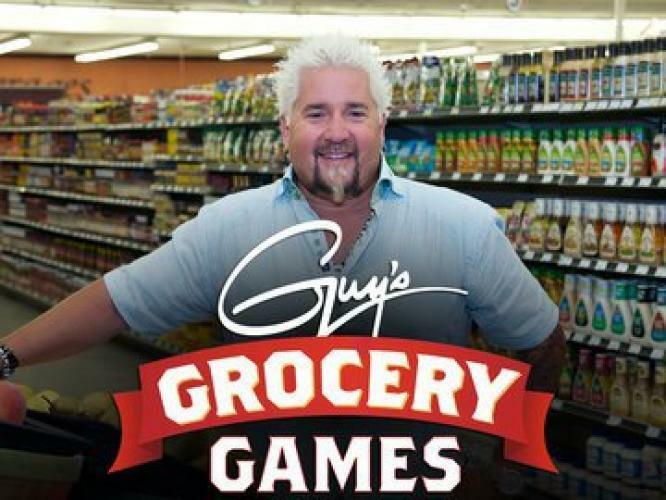 It's the finale of the Guy's Grocery Games: Superstars and the final four celebrity chefs are all vying to become the champion, but first they must face Guy Fieri's most diabolical challenge yet: The Double Wheel o' Games. They must play not one, but two extreme grocery games in each round as they attempt to prepare their best fried dish and a high-end dish. The final two culinary giants must then make their signature dish during two more treacherous games. Who will become the Superstar champion and win $40,000 for their charity? They've seen every episode and know every twist, and now three of GGG's biggest superfans get to play their favorite Flavortown games! Luckily, their favorite GGG judges are on hand to mentor them as they attempt to shop for a dynamite diner dish using kiddie carts. Then, these GGG aficionados must stretch their dollars to the limit to make their best seafood dinner on a budget. The last superfan standing gets to shop their favorite store, Flavortown Market, for up to $20,000! It's Halloween in Flavortown as four chefs do battle in a three-round fright fest! First, the chefs must include Guy Fieri's "red fright special" in their creepy comfort food dish. Then, they are challenged with making a midnight snack using only ingredients they can fit in a tiny trick or treat bucket. A cobwebbed Food Pyramid decides which spooky ingredients the final two chefs must feature in their haunted high-end dinner. Only the bravest chef will make it to the shopping spree and shop Flavortown for up to $20,000!